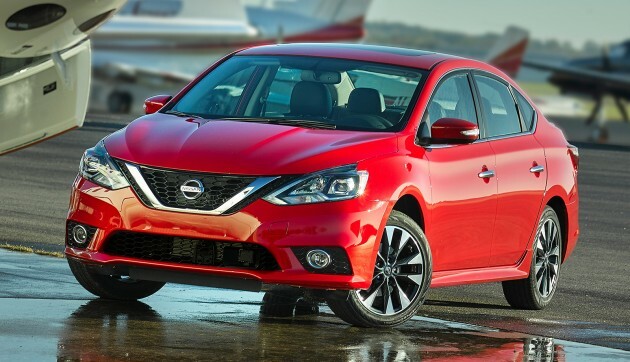 As expected, the US-market Nissan Sentra has received a midlife facelift. The C-segment sedan is known as the Pulsar in Australia and Sylphy to us in Malaysia. The 2016 Sentra sports a revised exterior and the addition of available safety and driving aid tech. The biggest change is up front, where the Sentra gets Nissan’s V-motion face to better fit in with the rest of the family. Still looking conservative next to the bold new Maxima and refreshed Altima (Teana to us), but it’s significantly more dynamic than before and an improvement. Highlights include new front and rear fascias, grille fenders, hood and signature boomerang-shaped headlights and tail lights and a new 17-inch aluminium-alloy wheel design. SR and SL grades add new LED low-beam headlights with LED signature accents. A new hue – Blue Pearl – makes it 10 colour options for the 2016 Sentra. Inside, the main event is a new steering wheel with a boss that’s much smaller than before. It looks similar to the one in the 370Z sports car, but with a Nissan badge of course. There’s also a new available power driver’s seat with power lumbar, new centre cluster and audio display design, new console and shift knob and refined seat fabrics. The instrument panel offers a new TFT-type LCD flat panel display with higher resolution. Sentra SV, SR and SL grades include a 5.0-inch Advanced Drive-Assist Display (ADAD) located between the two dials. These grades also include Siri Eyes Free Voice Recognition as standard. A number of Nissan’s Safety Shield Technologies are now available on the Sentra for the first time – Forward Emergency Braking, Intelligent Cruise Control, Blind Spot Warning and Rear Cross Traffic Alert. Also now available is NissanConnectSM Services powered by SiriusXM. It offers emergency preparedness, remote access, customisable alerts (speed, curfew and boundary notifications, for instance) and convenience services. Other available kit range from dual-zone air con, eight-speaker Bose audio, rear view monitor and keyless entry-push start. The 1.8 litre MRA8DE engine with 130 hp and 174 Nm soldiers on along with Nissan’s Xtronic CVT, but the latter gets a new D-Step Logic Control for a “more stable, natural and crisper shift feel”. The Sentra’s suspension has been retuned with a 10% increase in spring and damper rates, as well as enhanced body stiffness for improved roll and body control. New EPS mapping and tyres improve steering feel and response. Will we get the 2016 Sentra’s updates for our Sylphy facelift, or is this another sporty face that will remain in North America? Like what you see? Well, you never get such premium specs here. All given by TCM are pure lame stuff! So wait another 2 years plus before Malaysia get the facelift version. At the same price w/o excide duty probably can get this premium in Malaysia. You won’t go wrong with sushi cars. Said many times. Of course with this Sentra, Corolla is a better choice. Hopefully they get rid of the underwear shaped steering wheel in all malaysian nissans soon! Those things are a deal breaker when you compare interiors. Imho, this V grille looks more stunning on SUV(tall V) than sedan(flat V)..…. same as other car makers, our local counterpart will only offer cosmetic refresh rather than powertrain/safety wise…. Lackluster response for this c-segment babe. Hope TCM is offering something attractive.